Now on DVD and on demand. Watch now! Horses are legendary for their ability to reflect their caregivers emotions. This movie follows the rebellious, drug-using, self-abusive Alex, 16, who rues the move to a remote farm with her adoptive mother, until she bonds with the horses and meets a young woman of privilege with a gorgeous horse. It’s a coming of age story set against a gorgeous backdrop with a powerful, four-legged supporting cast. What was the genesis of this project? Why did you feel it was important to share this story? As a lot of older filmmakers, I like to look back at my teenage years. I had a fascination with horses and ponies. By spending much time with ponies as a teenager, I learned to love the animals and my fellow riders, most of them girls. This way, I met my first girlfriend at the early age of 14. I wanted to tell a story which is common to many teenage girls: the love for horses and sharing the caring for these animals. It’s a good way to find a balance in life. What was the most surprising aspect of making this film? That we were able to work with the tiniest crew of just four people, a very small budget and shot the film in three weeks. It gave us freedom to experiment. 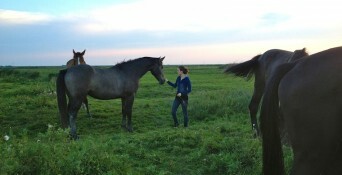 And it was surprising how easy it was to work with the horses. They seemed to have fun to be in front of the camera. How much I enjoyed to work without an assistant director, without a make-up artist, without an art director and without a costume designer. The small crew and cast lived together at a farm house in the middle of nowhere — our film location — and enjoying to be in the countryside, surrounded by animals. We’ve just shot the first part of a documentary on the changes in Rio de Janeiro through the big sport events. It is a follow-up on our documentary “Warrior of Light,” which we shot about 15 years ago. Posted June 16th, 2015 & filed under Entertainment.